There was some news out of Googleland recently that will impact the level of information marketers will have about visitors to their site. Unsurprisingly it’s probably going to benefit Google at the expense of marketers. Let’s take a look at what’s changed and how it might impact your business. You’ll be seeing a lot of “(not provided)” in Analytics. For anyone else (those not logged into Google), you can still see the search phrase they used to find your site. Google claims it was an effort to strengthen the privacy of their users, however many have speculated that it’s nothing more than another attempt to increase their bottom line. That speculation has a lot to do with the fact that their advertisers – those who use Google Adwords to place ads on Google’s sites – will continue to see logged-in users’ search terms in their reporting. So basically, Google’s not ok with releasing private information when the recipients of that information don’t pay – but perfectly ok with it if the recipients pay them nice monthly sums. How will this impact my business? 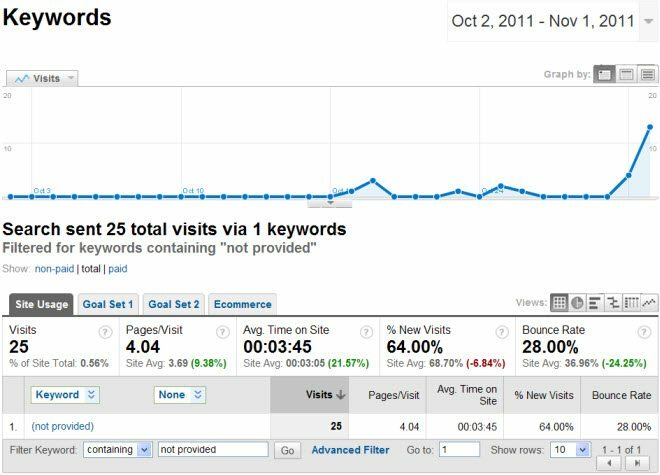 If you’re like us and you rely on website tracking software like Google Analytics to help guide you toward targeting keywords that help your bottom line, then this will certainly have an impact. If you don’t pay attention to the keywords your site’s visitors are using to find you then don’t worry about it. So just how much of an impact will this have? Well, that of course depends on (1) how many of your site’s visitors are logged into their Google Account when they search on Google and find your site and (2) whether you’re an Adwords user. If you’re an Adwords user you’ll continue to see search terms from logged-in users within your Adwords interface. If you don’t run Pay-Per-Click campaigns you might want to begin monitoring the keyword “(not included)” within your keyword reports to see how much it’s impacting your reporting. I’ve done cursory checks in our Google Analytics account for some of our clients and have found that in general the amount of keyword searches this impacts has been somewhere around 1% (SEOmoz and Search Engine Land have both reported around 2%). Obviously as the amount of people with Google Accounts continues to grow – and with the growing popularity of Google+ – this may present itself as increasingly problematic. But for now, try to relax. And remember that there are likely millions of companies like yours who are dealing with the same thing.